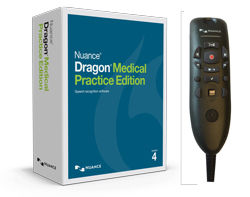 Released in January of 2018, Dragon Medical Practice Edition 4 is the latest version of Dragon for the medical provider. It is inteneded for the provider in a group of 24 or less and is the most full-featured and accurate version of Dragon Medical released to date. Medical vocabularies and acoustic models tuned for the way clinicians speak. Includes vocabularies for over 90 medical specialty and subspecialties. Regional accent support. Advanced adaptation techniques and accent-specific acoustic models ensures high speech recognition accuracy. Simplified interaction with EHRs. Eliminate navigation back to EHR screens with a hidden dictation box. Dragon Medical template library. Includes a full library of AutoTexts for standard notes and “medical normals” by body system. Smart configuration. Automatically detects hardware resources and determines the best use of infrastructure for optimal performance. No internet connection required. Locally-installed speech recognition ensures uninterrupted access. Recognition analytics. Automatically detects poor audio input and alerts the user with advice to remedy the situation and ensure high-accuracy results. Comments: This is the latest version of Dragon Medical Practice Edition and was released in January of 2018. This is the full "client-side" version of Dragon and does all the work on your local machine. This "Full Version" is designed for users new to Medical Practice Edition. If you already own DMP2, you can purchase the "Upgrade" to your current product for just $599. An alternative to DMPE4 is Dragon Medical One, the cloud-based version of Dragon which is sold on a subscription basis. Look at "Related Products" below to see a link to Dragon Medical One. Note: this is the boxed version of the DMPE4 and includes a PowerMic III microphone with a 3 ft. cord. We also sell the download version of DMPE4 if you would prefer to to get it quicker. In this case, you will need to order the PowerMic III separately and you won't get the bundled price. The download version is listed below under "related products". Contact us for assistance in product selection, set-up, or troubleshooting by calling 866-778-0524 weekdays 9-5 pm eastern time or email us at support@speechrecsolutions.com. Copyright , Speech Recognition Solutions, LLC. All rights reserved.